This week I have a after the season Thank You card. 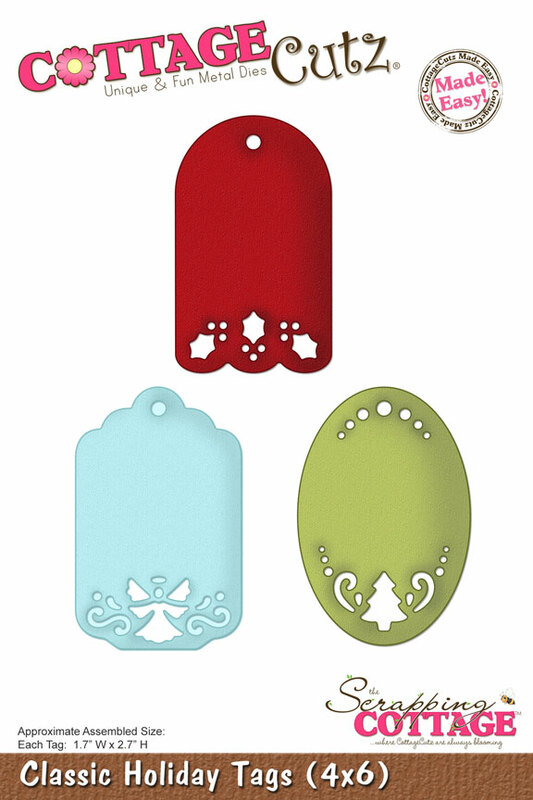 I wanted a simple elegance card using a Christmas die, but still not screaming Christmas. I used the Cottage Cutz ""Partridge & Pear Tree"" 4x4 die. I used solid white and pearlized white cardstock. This made a nice contrast, but yet kept the simple white I wanted. I cut the tree in white cardstock four times and the pearl white cardstock once. I wanted the tree to standout and be thick, so I glued two solid white and the pearl on top to create a chip board thick look. I added clear micro jewels and placed a simple bird in the tree. The bird was also from the Cottage Cutz die. . .I just snipped the gobble gobble off the top of his head. Than added the foil sentiment. The panel that the tree is mounted on is 3 1/4" x 5 3/4". The border down each side of the card was also made from the Cottage Cutz Partridge & a Pear Tree die. With the other two trees that I cut out of white cardstock I cut two slightly wider than 1/2" borders. The card was cut from a 4 1/4" x 5 3/4" front panel out of pearl cardstock. I glued the 1/2" border down each side of the pearl cardstock cut side in. . puzzle piecing a little. Than I used foam dots and added the center tree panel, the panel covered up the straight cut edge of the border. The edge is flipped in color contrast (white on pearl) from the pane. Using the tree to make the border means the scroll border edge on the card matches the scroll work on the tree.. Here I used the same concept on a heart. Below is the back of the heart showing how I glued the scroll border around the edge. On a 2 3/4" high heart one tree did a little over half the heart. You do need to do a little more snipping of the border to go around the curves, but as you look at the finished heart. . it turns out great from the front and you do not notice the stop and start. Hope every one had a great Christmas and we are all looking forward to a good New Year. Greetings friends and bloggers. It's Carol here. 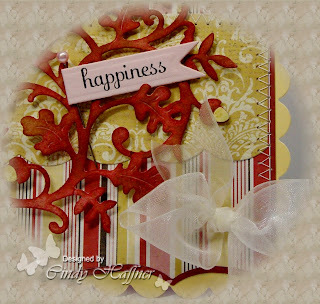 Today I have a double criss cross card to share with you using the awesome CottageCutz dies. I think my go to die forChristmas cards for 2012r is the Filigree Deer. This is the third card I made with the deer this year. 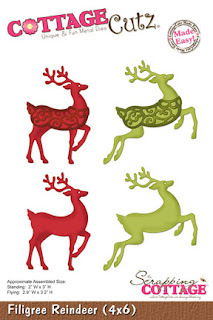 I just love the shape of the deer. 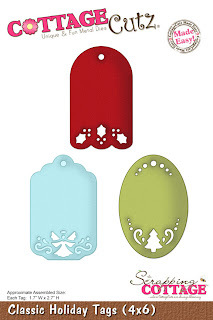 I also used the Classic Holiday Tags to fill my pockets in this card. The pockets on this card were decorated with a Martha Stewart Punch and Recollection Ribbon. The sentiment is a Recollection sticker and I decorated the tags with stickers and trimmed them with gold stickles. I used the tutorial here to create this card. It was fast, fun, and easy. Below are the CottageCutz dies I used. Thank you so much for stopping by. I hope you had a wonderful and blessed Christmas with your family and wish you all the very best in the New Year. Hi everyone! I hope you all had a Merry Christmas/Happy Holiday etc. Mine was wonderful, spent with loved ones and we even had a dusting of snow. I would love to continue to show you Christmas cards but today I am showcasing the CottageCutz Canning Jar With Accessories from the Harvest Season Release. 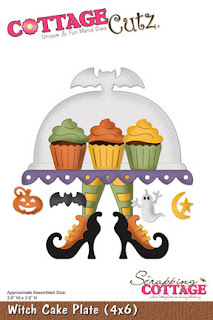 This die has pickles, olives, strawberries and cherries. It also has the blossoms from the strawberries, so it is very versatile. 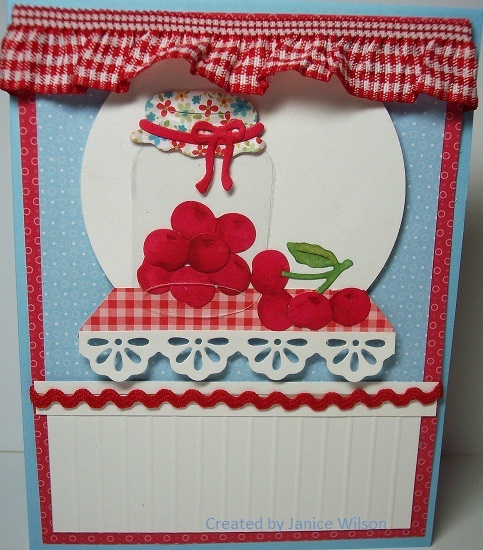 I used my favorite color combination of red, white and blue, gingham and cherries. I used clear scrap plastic to cut the jar from. The cherries were cut from white cardstock and colored with copic sketch markers RV29 and R46. The jar lid was cut from patterned paper. I scored the white cardstock to look like wainscoting and made the finished card into a cottage kitchen scene. I wish you all a safe, happy, and healthy New Year and I will be back on the 7th! 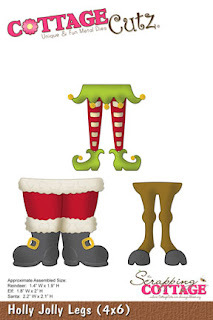 Merry Christmas Eve to everyone! !~ Today I have a BEAUTIFUL CottageCutz Design. I have used Autumn Acorn Vine. I cut it out with design paper and then sponged it with cranberry ink. Hello everyone Cheryl here with a CottageCutz Christmas card. 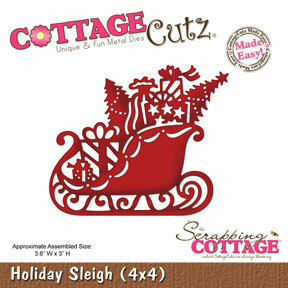 For my care I wanted to use CottageCutz Holiday Sleigh and Filigree Reindeer together, and they sure look perfect together!!! Next I airbrushed the outside of the sleigh to give it some distressing. You can do this with ink pads too, or with dusting. My CottageCutz Filigree Reindeer is Dusted with Tim holtz ink and a duster. I then added the same glitter card stock and airbrushed it. 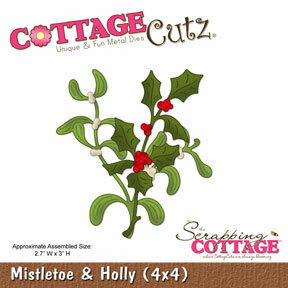 The CottageCutz Mistletoe & Holly is colored with copics. Lastly I added some Ribbon , pearls, and sewing to complete my card. Hello CottageCutz Fans. It's Carol here today. Don't you just love Christmas Lights. I remember when I was younger my parents would take us to the city to view the Christmas lights. They would be strung from light pole to light pole over the streets and it was so beautiful. 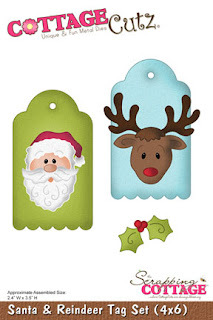 When I decided to use the Moose for my card I couldn't help but want to string these Recollection sticker lights around my card to coordinate with the lights that decorate the Moose antlers. 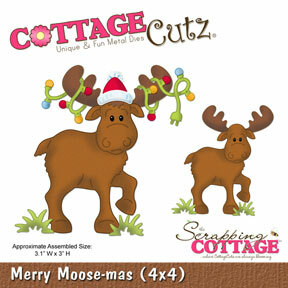 The Moose has been popped up on an embossed Spellbinders die cut. A couple of Recollection flowers, green glitter leaves, and a Recollection sentiment and this card is ready to "light" up someone for Christmas. Fast, Fun, and Fantastic. It doesn't get any easier than that. Here is the die I used. Isn't he just cute. You can get yours here. He was so much fun to die cut and put together. A little Brush Corduroy distress ink and he was good to go. I loved assembling the lights on the antlers-that was fun. Thanks for stopping by today to see my creations. Merry Moose-mas! 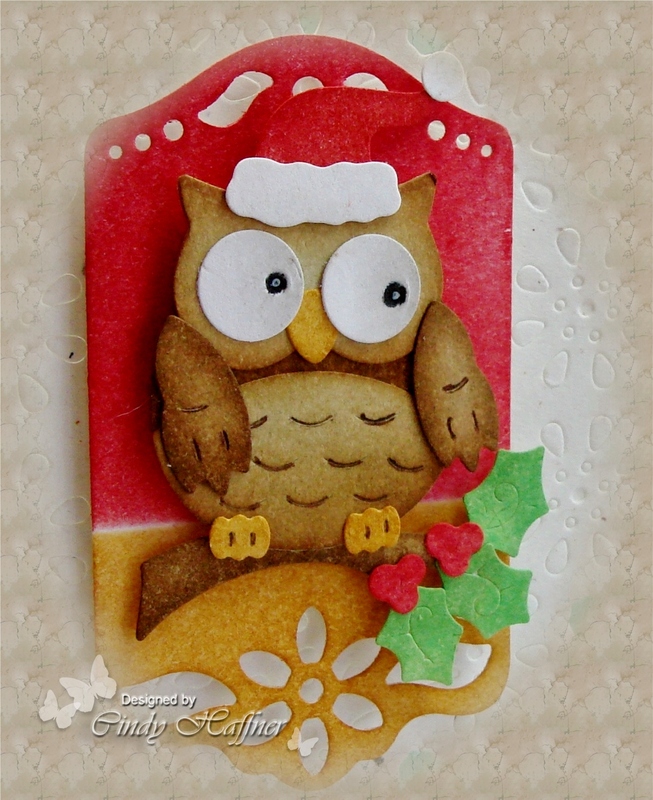 Hello everyone, today I'm sharing a Funky Fold Card made using several CottageCutz dies. For the Inside I used the CottageCutz Holly & Berry Border, and thought it would be perfect fit for the inside and it was. I also used more of the Mistletoe & Holly for the front of my card as shown below. I did use some Creative Inspiration Paints on all my pieces, and glitter too!!! I hope everyone has a wonderful week and a Very Merry Christmas!!! Hello CottageCutz fans! 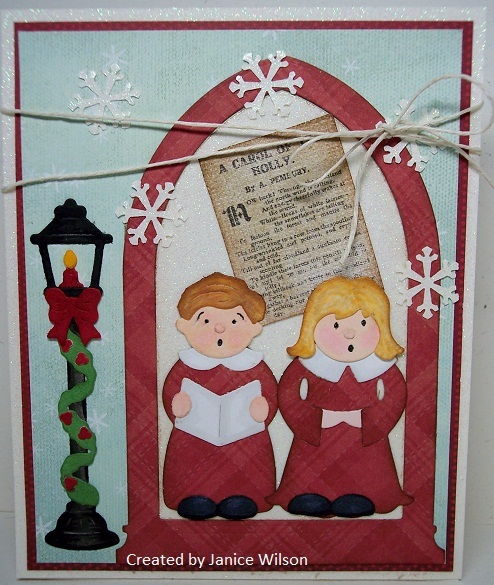 Today my card features the CottageCutz Holiday Carolers. I cut the images from white cardstock and then I cut the gowns from red plaid from the Recollections Sugar Plums line. The rest I colored with Copics. The printed song behind the carolers is from Old World Winter paper pack by the Paper Studio. I used Vintage Photo distress ink around the images. It makes the images look less flat. I assembled the card and punched a few snowflakes from glitter paper, then tied a little bow from string to finish the card.